Heat pumps allow the utilization of free environmental energy. Their build-up is equivalent to a cooling unit. With the help of electric energy they can use existing free environmental energy from wells, soils or ambient atmospere for heating purposes, by pumping it on higher temperature level. The test stand demonstrates practically the dependencies of the thermo-dynamical cycle process. 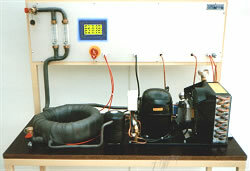 Above photo shows on right heat pump producing hot water for air-heating (Test stand "Fan- and thermic measurements"). The stand is moveable and can be connected to a warm water consumer like Test stand "Fan and thermic measurements"
Heat pumps allow the utilization of free environmental energy. Their build-up is equivalent to a cooling unit. With the help of electric energy they can use existing free environmental energy from wells, soils or ambient atmospere for heating purposes, by pumping it on higher temperature level. The stand is moveable and connectable to Solar collector. qc is the effective heat with the niveau tc. qo is the for cooling processes usable refrigerating capacity. In the diagram you can see that efficiency E depends on tc and to and on the quality of the plant's devices. This dependency can be shown with this test stand.